Giger's friend Bijan Alaam's story about this was that there was a great fear of nuclear war towards the time when Giger composed this picture, reaching it's climax with the Cuban crisis. People there feared that a nuclear war could break out and as we knew from Hiroshima, monstrosities could be created by mutation. 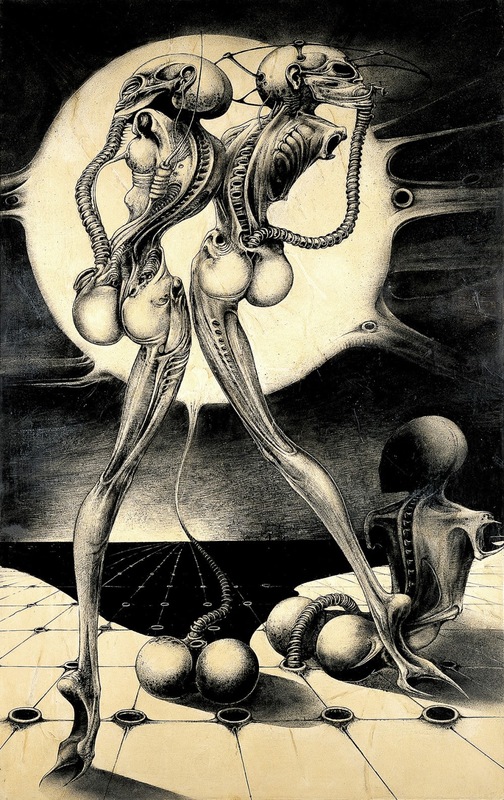 Giger was very much impressed and affected by this and he called his first ink drawings The Atomic children, as if a nuclear war had taken place and left amputees and monstrosities created by radiation in 1967. The drawing he did by spraying black ink on transparent paper which is used by architects, and then scratch away at it with a razor blade. 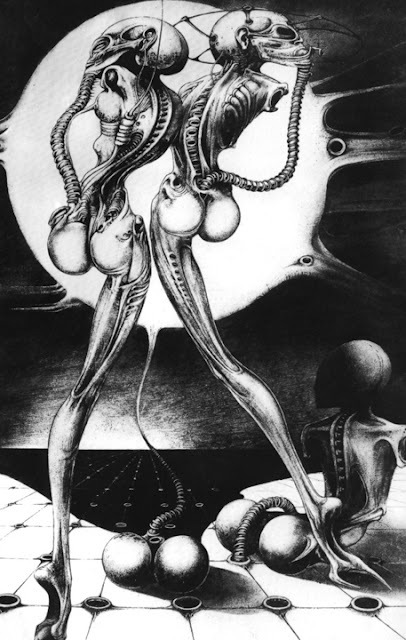 Giger would come to describe his Atom Kinder as cyberpunks, wearing virtual reality headpieces. Back at the time Cyberpunks didn't exist as a term, it would be coined by Bruce Bethke in 1980 for his short story "Cyberpunk" and then made popular by the likes of William Gibson in his novel "Neuromancer". Did Giger have an idea anywhere near to this at the time about his Atom Kinder?